Disclosure: Candlewick Press gave me an advance copy of this book free of charge to review. All opinions in my review are my own and I did not receive any other compensation. As in all my reviews I am providing links for your ease, but receive no compensation. Have you discovered The Princess in Black yet? I wrote about our discovery of this amazing series back in July. Hazel chose The Princess in Black as her prize for finishing the Barnes and Noble Summer Reading Program. It had been a tough choice, but she was really glad with the outcome!! This became one of her favorite books ever. 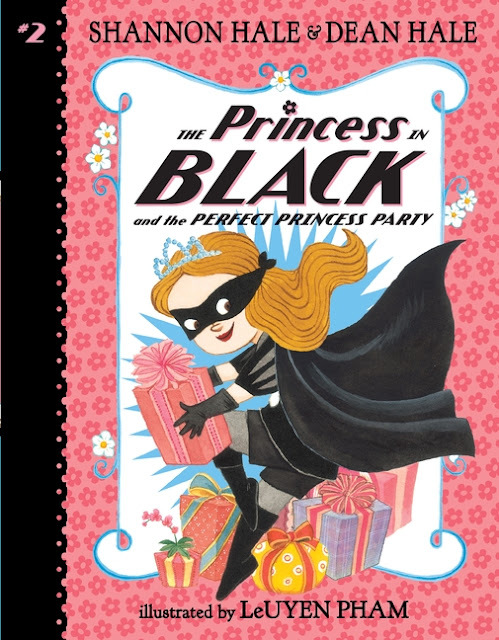 Then we discovered that a new Princess in Black book was coming out October 13th and from Candlewick Press--one of our favorite publishers. I asked for a review copy and they sent it right away. Can I tell you how excited Hazel was to have the second book in the series months early? Oh, my, she has been telling everyone about it. 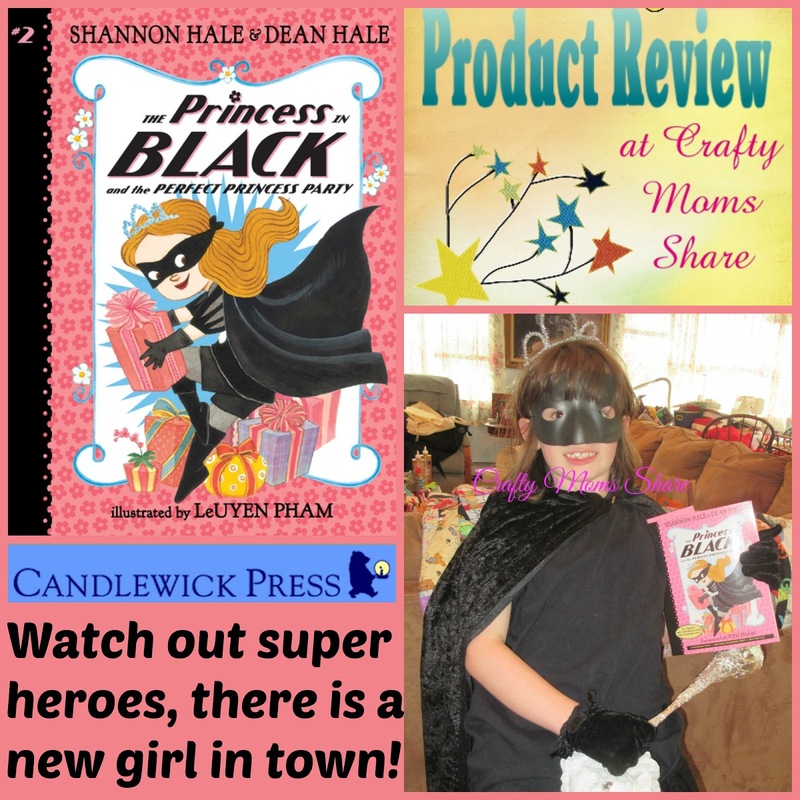 Anyway, today we are sharing The Princess in Black and The Perfect Princess Party by Shannon Hale and Dean Hale and illustrated by LeUyen Pham. 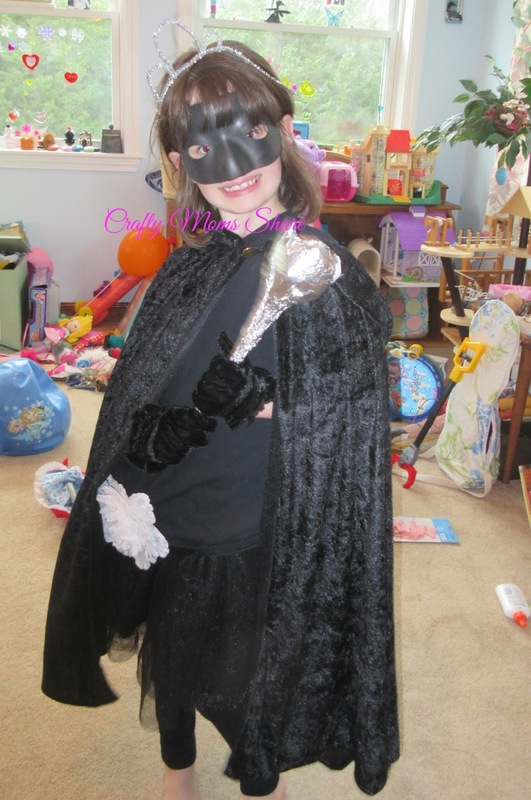 In The Princess in Black, the reader discovers that Princess Magnolia is a proper princess who loves to wear pink frilly dresses however she has a secret. When her monster alarm goes off she sneaks into the broom closet and changes into the Princess in Black and she and her trusty pony, Blackie, ride off the goat field to fight the monsters. Well this book is no different. It is Princess Magnolia's birthday and she had the perfect party planned. As she is finishing her last minute getting ready, the monster alarm goes off. She goes off to fight a monster and save the goats. Then throughout the party Princess Magnolia has to make excuses to her princess guests to escape and fight more monsters. Will Princess Magnolia ever get to open her gifts? The thing we love about this series is that it is a princess who is fighting the monsters. This princess, who seems to live by herself, takes care of her kingdom by changing to a superhero since pink frilly dresses are not helpful when it comes to fighting monsters. I also love that Hazel can read these books herself now. I read them to her the first time, and she has read them again and again to herself and others. She LOVES them!! She has even decided that she wants to be the Princess in Black for Halloween. We have been gathering things for her costume. We bought a black t-shirt and black leggings with her black tutu and black velvet gloves (from Gymboree). 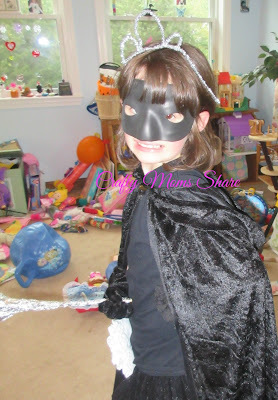 We pulled out a black cape I had bought in a post Halloween clearance sale a few years ago and a black mask. I found a white flower clip which we clipped onto her t-shirt and we made her a scepter and a tiara. The tiara is made from two silver pipe cleaners. 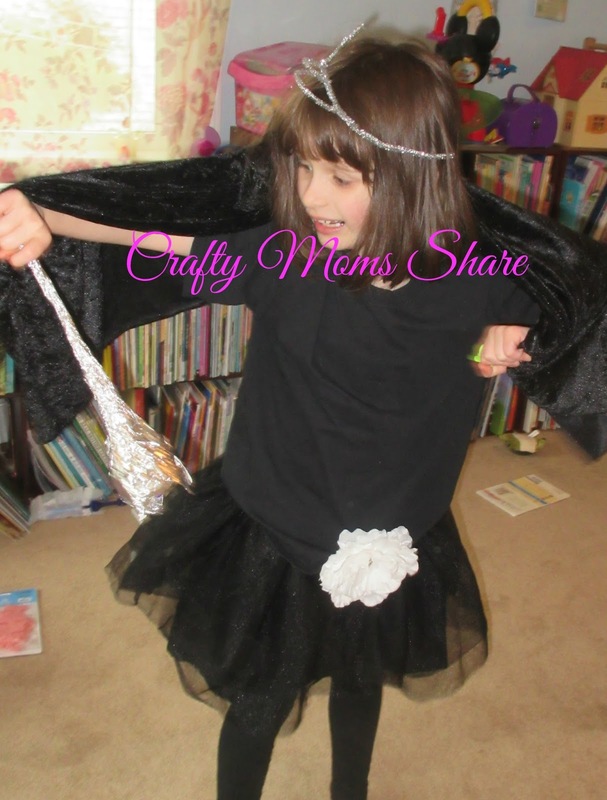 For the scepter, I took the one we made for the Queen Esther story and added a border of tin foil making peaks like the Princess in Black's scepter. Last year I bought her a mermaid and a fairy costume on clearance from Gymboree with the plans of her using one of them this year for Halloween, but now she wants to be the Princess in Black and I cannot blame her. 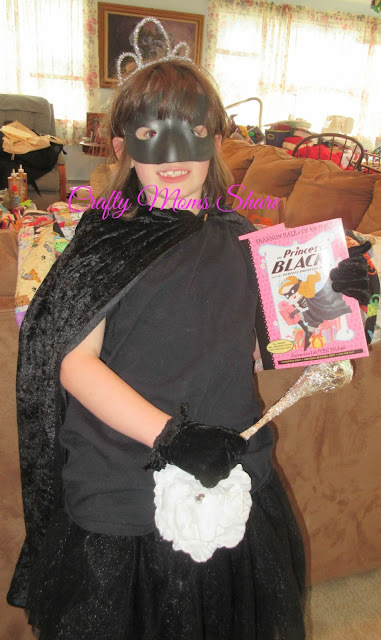 The Princess in Black is a wonderful role model for young girls and I love that they are emerging reader chapter books so she can read them herself. I just noticed a third book is coming out in February. I cannot wait to get that one for her. These books take away all the fragile princess stereotypes and really give the girls someone to look up to with the fun dresses and all as well.